To decipher genetic information, molecular biology has equipped new tools used in trials to improve and reconstruct the evolution and taxonomy of organisms. The avail of molecular methods, in Cyanobacteria, is to study the genotypic relations is a foot. The practicality of macromolecular and chemotaxonomic techniques is scrutinized and their usefulness is guesstimated. The controversial taxonomic problems were solved by using cyanobacterial phylogenetic scheme is based on 16Sr RNA sequence analysis. The morphological features and simple testing methods which are congruent with the genotypic groupings for taxonomic purposes are essential. Genetic engineering has proved to be an important tool in improving various metabolites in Cyanobacteria. It has also contributed in the genetic breeding of Cyanobacteria to obtain highly productive strains. The molecular biology aspects can also be applied to engineer the Cyanobacteria for enhancement in the area of biofuel production. For desirable biotechnological applications of Cyanobacteria, the Genetic tools are crucial. Cyanobacteria are the quintessential organisms annexed their energy from oxygenic photosynthesis for growth and development. They have uniquely accommodated both a photosynthetic electron transport chain and a respiratory electron transport chain within a single prokaryotic cell . Cyanobacteria in addition are also capable of nitrogen fixation [2-4] these oxygenic phototrophic organisms are often called the bioenergetic ‘nonplus –ultra’ among living beings. For the growth and proliferation, they utilize, water, sunlight, atmospheric air and exiguous minerals for their needs. The stable accommodation of a cyanobacterium into a non-photosynthetic eukaryote was a milestone in the evolution of all other oxygenic photosynthetic organisms. During evolution, endosymbiosis, occurred once and complement the chloroplast origin [5,6]. This is the basis dogma reason for the voluminous use of Cyanobacteria to cogitate the photosynthesis fundamental processes and other photosynthetic complexes structures [7-11]. Cyanobacteria are chopchop growing prokaryotic organisms, which can facilely be genetically modified. Cyanobacterium Synechocystis sp. PCC 6803 genome sequencing , a model organism for the research into photosynthesis and related processes was pondering work. This would not have been possible without the entry of techniques and genetic tools to aid mutational experiments. For the analysis of various aspects of cyanobacterial physiology and development, colossal studies have been made in developing genetic systems. 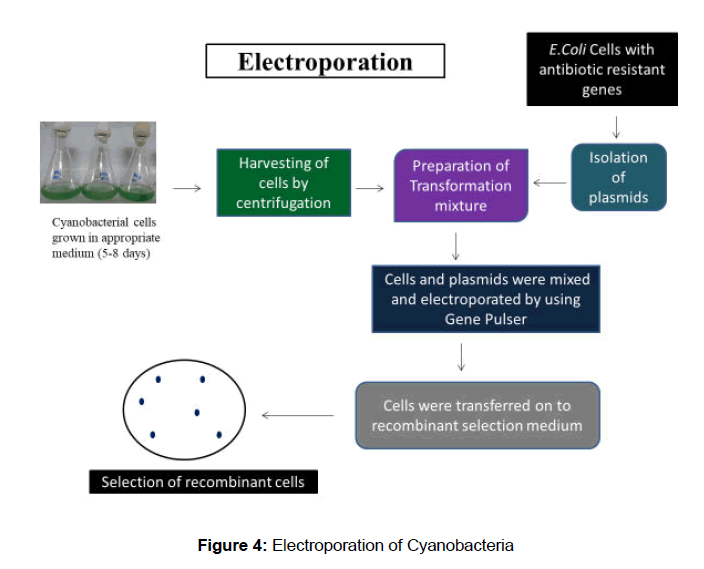 Transformation, electroporation and conjugation systems sustain trenchant gene transfer in disparate cyanobacterial strains. For the precocious studies of cyanobacterial photosynthesis, nitrogen fixation, heterocyst development and metabolism, gene transfer, mingled with the bequest to clone and inactivate genes in these unique and important prokaryotic microorganisms. Almost ten years ago the first conjugation system for Cyanobacteria was described. There are numerous sophisticated gene transfer techniques were developed, cyanobacterial plasmids were isolated, vectors were constructed and the first cyanobacterial genes were cloned. For the genetic analysis of Cyanobacteria, the constituents for assembly into powerful and sophisticated systems were ready by the late 1980’s. Many excellent reviews over the last few years have depict the progression of many facet of genetic systems in Cyanobacteria [13-18] and several articles have reviewed and described methodologies [19-25]. Extensive tables compiled by [14,26,27] provide valuable information on strain designations, restriction endonucleases, and cyanobacterial plasmids and cloning vectors. In addition, several laboratories are quest of biotechnological pertinence of Cyanobacteria in terms of hydrogen or biofuel production [28-30] or exploitation of interesting pigments or bioactive compounds from Cyanobacteria [31,32]. Transposons having reporter gene can concurrently subdue a gene and report expression of the interrupted gene afford a powerful tool for the identification of environmentally regulated genes. The technique of pulsedfield gel electrophoresis, combined with Southern hybridization analysis using cloned cyanobacterial genes and transposon-tagged as probes, has allowed the construction of the first detailed maps of cyanobacterial chromosomes. Since the available data concerning genetic manipulation systems for many other Cyanobacteria – unicellular as well as filamentous strains- are huge, this review concentrates on the current state of art and on potential applications. Photosynthetic microorganisms are able to produce a multifarious pattern of renewable biochemical products. Cyanobacteria and some microalgae are considered as photosynthetic, auspicious pothunters for many implied applications includes biomass (food supplements and aquaculture feed), environmental applications (biofuels, waste water treatment, CO2 mollification), high value products production (pigments, polyunsaturated fatty acids, vitamins) [33-37]. These photosynthetic microorganisms boost the need for steadfast, efficious and economical processes with constant quality products. Cyanobacteria, being photosynthetic organisms, use the sun’s energy, H2O and CO2 to synthesize their energy storage compounds i.e. carbohydrates, lipids and proteins. These energy storage components from a potential feedstock which can be converted into bioenergy. The main precursors of Cyanobacteria are only sunlight, carbon dioxide, water and minimal nutrients for growth, eliminating the cost of carbon sources and complex growth media. Sunlight is the most without demur available and dirt-cheap resource on earth and the use of cyanobacteria for the production of profitable products and biofuels from solar energy offers a verduous path for the synthesis process. 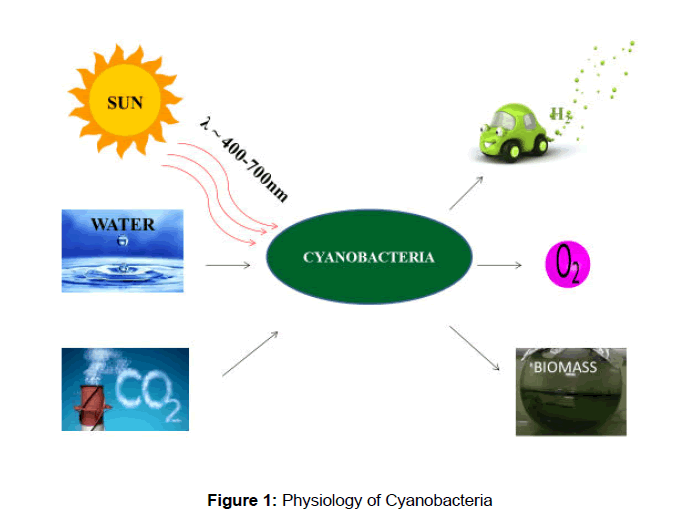 Cyanobacteria decked with photosynthetic capabilities, have higher photosynthesis and biomass production rates compared to plants, convert upto 3-9% of the solar energy into biomass to collate ≤ 0.25-3% achieved by crops for instance corn, sugarcane . As the need of cyanobacteria increases, continous production systems are attracting interest, according to many authors these systems are the most achievable and successful for the large scale production of the photosynthetic microbes mainly due to decrease of labour costs, lower investments, operational costs and decrease of unprofitable periods [39-45]. Cyanobacteria are ancient autotrophs, responsible for increasing the levels of oxygen and CO2 mitigation in Earth’s atmosphere as they share many similarities with the higher plants and green algae chloroplasts but differs in biosynthetically [46-50]. Cyanobacteria store glycogen instead of starch [51-53] under stress conditions they accumulate polyhydroxybutyrate from acetyl COA . The interest of bioenergy from Cyanobacteria is gaining popularity in research communities focused on photosynthesis, genetic engineering of growth systems and metabolic pathways [55-62]. An avant-garde cyanobacterial cultivation systems has been developed for scaling up practices as well as strain characterization . Cyanobacteria include unicellular and filamentous forms and vary from spherical, oval, fusiform, rod –like to irregular in shape . Cell size ranges from 0.5 μm to 60 μm. They are Gram negative has a peptidoglycan cell wall and sandwiched between cytoplasmic and outer membranes . Cyanobacteria, a prokaryote do not have nuclear envelope or a true nucleus, but rather have a nucleoid. The cytoplasm contains the photosynthetic apparatus, called thylakoids, which contains the phycobilisomes . Cyanobacteria are the only members of the domain Bacteria with the ability of oxygenic phototsynthesis. They possess photosynthetic apparatus with two photosystems (PSI and PSII) each with a unique reaction centre (RC) and chlorophyll a (Chl a) and phycobilisomes, which consists of phycobilins covalently bound to phycobili proteins as peculiar light harvesting systems. In contrast to Cyanobacteria many prochlorphytes contain Chl a and Chl b and lack phycobilins [66,67] and the Cyanobacterium Acayocholris marina harvests far-red light with Chl d for photosynthesis underneath minute coral reef invertebrates . Nitrogen fixation was carried out by most of Cyanobacteria . Many filamentous but some unicellular Cyanobacteria move by gliding motility directed by light i.e. phototaxis [70-73]. Cyanobacteria are monophyletic but morphologically and physiologically diverse. They were one of the earliest organisms on this planet and they played a key role in the formation of atmospheric oxygen [74,75]. The early occurrence of Cyanobacteria on the Earth has been concluded from molecular-phylogenetic analysis [67,76-78] studies on the rise of atmospheric oxygen  and micro-paleontological investigations [80-82]. Recent research fields indicate that the oxygenic photosynthesis by Cyanobacteria originated about 2,340 million years before present (Ma). Assumably, anoxygenic photosynthesis with one photosystem was a precurssor of oxygenic photosynthesis with two photosystems. The three major lineages of bacteria (actinobacteria, Deinococcus and Cyanobacteria) contributed to an early colonization of land . The geological and geochemical data analysis showed that the Cyanobacteria or their ancestors originated in the Archean eon, approximately 2,700 Ma. The increase in the oxygen level after the beginning of oxidative photosynthesis remained very low, about 10-5 of the present atmospheric level for about 400 million years . (Figure 1). Cyanobacteria possess genes responsible for the production of bio hydrogen, which is a forethought as an alternate source of energy . Subsistence of their facile, autotrophic growth requirements, Cyanobacteria are promising organisms for bio-fuel production (ethanol) by genetic engineering to scale down the dependency on the depleting fossil fuel reserves . They are also helpful for controlling mosquito borne diseases by expressing insecticidal cry proteins from Bacillus thuriengenesis ssp. israelensis (Bti) . In order to get the overall triumphant benefits from cyanobacteria in an eco-friendly manner, receptiveness of genetic manipulation to strains is necessary which involves the transfer of genes in a living cell (transformation) both chromosomal and plasmid transformation are possible with Cyanobacteria . Rapidly growing demand and development of bio energy from Cyanobacteria and the profitable production of cosmetics and pharmaceuticals from cyanobacterial natural products, the genetic engineering of Cyanobacteria has been magnetizing to boost up the attention to overcome the biomass problems in industrial applications  to modify the metabolic pathway for high value products , to architect the bio-bricks for artificial photoautotroph in the promising field of synthetic biology [90,91]. During nitrogen deprivation, a glycogen-deficient mutant, Synechocystis 6803 (ADP- glucose pyrophosphorylase knock out) secreates pyruvate and α- ketoglutarate. These sugars and organic acids are converted into alcohols for biofuels [92,93]. Sucrose, glucose, fructose, glycosyl- glycerate and lactate export from transgenic Cyanobacteria has also been achieved [94-97]. Controlled parameters ranging from light and nutrient availability to salinity, temperature and pH can be used to find maximal productivity, suspend the cells at a particular doubling rate or determine the limits of cell viability under stress among many other applications [98-100]. The heterologous expression of a plant TPS in a photosynthetic microbe was described in Synechocystis sp. PCC 6803 upon transformation with the Pueraria montana isoprene synthetase gene . Isoprene (C5H8), a volatile hemiterpene product was synthesized at a rate of 4 μg isoprene L-1h-1  similar results were seen in Synechocystis successfully transformed with the β- caryophyllene synthase from Aretemisia annua  and the β-phellandrene synthase from Lavandular angustfolia  permitting accumulation of the sesquiterpene β- caryophyllene and the monoterpene β- phellandrene. All three TPSs were cloned into the Synechocystis genome at the psbA2 locus via double homologous recombination, with expression in a light dependent manner . In recent years, the expression of genes in Synechococcus sp. strain PCC 7942 was achieved the human carbonic anhydrase gene caII used to investigate CO2 concentrating mechanisms  E.coli and human superoxide dismutase genes used to investigate oxidative stress [106,107], E.coli pet genes used to increase salt stress resistance  and Bacillus thureingenesis larvicidal genes used to develop bioinsecticidal hosts [109,110] are expressed in Synechococcus sp. at high levels to produce palpable phenotypes. The genes pdc and adh from Zymomonas mobilis were cloned into shuttle vector and transformed into Synechococcus sp. strain PCC 7942, a significant amount of ethanol was accumulated in the culture medium . Ethanol production from Cyanobacteria have been significantly increased [112,113]. Many enzymes have displayed lowered activity when transferred into Cyanobacteria results in limited production [114,115]. To mitigate the problems of greenhouse gases, renewable strategies for algal recycling of nitrogen have been proposed . The possibilities for engineering the atmospheric nitrogen fixing cyanobacterial strains as production systems to be scrutinized (Table 1) [117,118]. Many common cloning vectors based on pBR322 i.e., the pUC series of vectors beyond pUC7 and p-Bluescript) have lost the oriT (bom) site and cannot be used for conjugation; however, plasmids with a variety of useful features for conjugation to Anabena sp. and other cyanobacteria have been created [87,119,120,121]. There is no evidence that most E.coli replicons function in cyanobacteria . It appears, however, that IncQ plasmids (pKT210 or pKT230)  can transfer to and replicate in some cyanobacteria after mobilization by the broad–host-range conjugal plasmid, RP4 [123-125]. A mobilizable plasmid based on pBR325 that contains the oriT from an IncP plasmid has been divulged to transfer to and replicate in Plectonema boryanum strain UTEX 594 (Tables 2-3) . The first cyanobacterial expression vector, pFC1, based on λ regulatory signals, which provide temperature-controlled gene expression in S.7942  or S.6803  and on the conjugative plasmid RSF1010 , which facilitates autonomous replication in Synechocystis sp. strains PCC6803 and PCC6714 or Synechococcus sp. strains PCC7942 and PCC6301 . A powerful substitute vector pMB13 for pFC1, produce proteolytically instable proteins. These vectors are used in in vivo studies of Cyanobacteria . The replicating shuttle vectors include two replicons: one that allows replication of the plasmid in E. coli and one that allows replication in the host strain. These vectors have been constructed by cloning into a mobilizable E. coli plasmid i.e., a plasmid with oriTsite, a segment of a cyanobacterial plasmid that includes the genes required for replication. A variety of shuttle vectors for transformation have been constructed using plasmids from unicellular Cyanobacteria. These plasmids typically lack oriT and thus cannot be mobilized [16,20] however mobilizable shuttle vectors that replicate in several unicellular or filamentous Cyanobacteria are available [16,20,119,132-134]. Vectors that include the replication origin from pDU1, a plasmid from Nostoc sp. strain PCC 7524 [135-137] allow autonomous replication in several strains of Cyanobacteria [87,119,138,139]. The stability of the transformed foreign gene, the efficiency of expression and frequency of transformation was confined by reporter gene. It is also used to determine the expressed protein and its locality in the transformed cells. GUS and lacZ are the extensively used reporter genes in marine algal transformation. The reporter marker genes subsuming chromogenic, fluorogenic and bioluminescence markers. GUS (β-glucuronidase gene from E.coli) system, which produces a fluorogenic product that can be detected at very low level. The reporter gene lacZ and luc expressed in A. cylindrica and Synechocystis sp. Cyanobacterial colonies carrying lacZ gene produce blue colour i.e, well differentiated from wild type green colour colonies. These E. coli promoters are well recognized by A. cylindrica and Synechocystis sp. . Effective selection marker genes are important to contradistinguish the successful transformants from transformed cells. The selectable markers include two types, the genes conferring antibiotics of higher plants are commonly used in selection of marine algal transformants. The other type is homologous complementation of metabolic mutants, used for chloroplasts transformations. The lists of selectable markers in microalgal were compiled in past reviews [141-143]. The efforts have to be made for alternate markers and standardize marker free selection as there is shooting match in the biosafety . Conjugation, which is DNA transfer mediated by cell-to-cell contact, is based upon the mobilization of DNA from one bacterium to another bacterium by a broad-host-range conjugative plasmid. Conjugation has been the method of choice for gene transfer in filamentous Cyanobacteria, but is also useful for unicellular Cyanobacteria [119,123,125]. The methodology, first described  and has been extensively reviewed [19-20,145]. 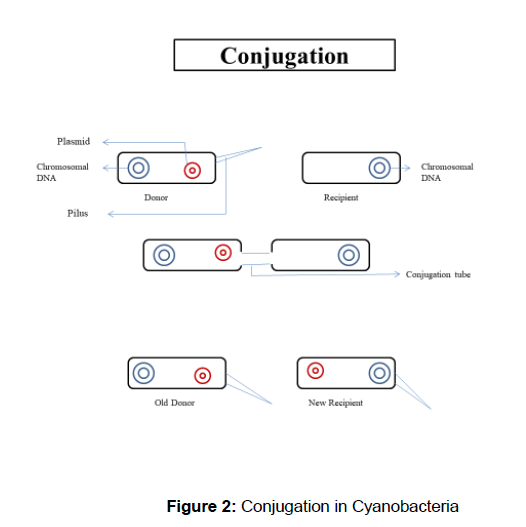 Three plasmids are consistently concerned in conjugative transfer of DNA to Cyanobacteria. The plasmid to be transferred to the cyanobacterial host (cargoplasmid) must have a site called bom or oriT, that is nicked by an enzyme (the mob product) prior to transfer. The nicking enzyme is usually produced in trans by a second helper plasmid in the same donor cell. The nicked strand is mobilized from the donor cell to recipient cell via transfer (tra) gene products provided by a third, mobilizing plasmid may be maintained in the same donor cell as the other two plasmids or it can be transferred to from a separate E.coli cell to cell containing the cargo and helper plasmids during conjugation. Maintenance of multiple plasmids in one strain requires that the plasmids be compatible i.e., that they have different replicons. In triparental matings, the conjugative plasmid is in one E. coli strain, the cargo and the helper plasmids are in a second strain and the third partner is the recipient cyanobacterial cell. The donor DNA is probably transferred as single-stranded DNA; a new strand is synthesized immediately by the host cell, probably during transfer. The transferred plasmid can re-circularize and replicate if the plasmid has a replicon that functions in the recipient cell. The transferred DNA may also recombine with homologous DNA in either the chromosome or in another plasmid in the recipient cell. Although transformation was also utilized for manipulation of filamentous strains, nowadays conjugation is the prevailing method to manipulation of Cyanobacteria genetically [119,146,147]. In addition, conjugation is commonly used for genetic manipulation of unicellular Cyanobacteria (Figure 2) [148,149]. Transformation, which is the transfer of free DNA into cells, was first described for Synechococcus sp. strain PCC 7943 . Many years ago and remains today the primary means for gene transfer in unicellular Cyanobacteria. Transformation has been thoroughly summarized [15,151] and the methodology has also been described well [152,153]. In addition to the original transformable strain, two close relatives, Synechococcus sp. strain PCC6301  and Synechococcus sp. strain PCC 7942 , are also transformable. These three strains are genetically very kin [156-157]; however transformation has been studied in more detail in Synechococcus sp. strain PCC 7942 because it is highly transformable . The bacterium Synechococcus sp. PCC 6803 has become a very attractive model organism since the publication of its genome sequence by . This was the first complete genome sequence of photosynthetic organism thus raising not only cyanobacterial genetics and physiology to a higher level but also phototsynthesis research. As Synechocystis sp. PCC 6803 is able to grow mixotrophically on glucose with impaired photosystems I and II, several laboratories started to use this organism for the study of phototsynthesis in the eighties of the last century [159-162]. The mechanism of transformation in Cyanobacteria is below par understood; however most of these unicellular strains are naturally competent and the mechanism may claim some pecularity with other transformable bacteria . One strain in which transformation can be induced is Synechocystis sp. strain PCC 6308, which requires CaCl2 treatment for competency. The ability of heterologous DNA to compete with homologous DNA for uptake in Synechococcus sp. strain PCC 7942  and in Synechococcus sp. strain PCC 7002  may imply a mechanism similar to that of transformable Gram positive heterotrophic bacteria. Cyanobacteria pop in to be competent during all phases of growth [150,164,165] however, cells are usually transformed during mid-to-late-exponential growth . Transformation is dependent on DNA concentration; it shows single–hit kinetics, with full saturation at concentration as low as 1.0 μg.ml-1 in Synechococcus sp. strain PCC 7002 and as high as 50 μg.ml-1 in Synechocystis sp. strain PCC 6803 [151,164,165]. While transformation frequencies are variable between experiments in the same strain, typical values are 103-105 μg-1 of DNA . Clear indications for a functional link between Tfp and natural competence this term refers to the ability of bacteria to take up extracellular DNA-were first provided by  and later by . Many bacteria exhibiting Tfp indeed are naturally transformable  and this competence is often dependent on intact piliation, where upon in some cases, Tfp assembly factors rather than the pili structures itself are required for transformation . For naturally transformable bacteria that exhibit Tfp on their surfaces, the presence of these appendages appears to be connected with competence [166,170-172]. Yoshihara et al. suggested a fundamental role of type IV pili in the natural competence of unicellular Cyanobacteria. The gene product of pilB1 exhibits NTPase activity and is regarded as a pilus extension motor that is indispensible for pilus assembly (Figure 3) [173,174]. Electroporation has also been used to transform several Cyanobacteria, Microcystis aeruginosa, Thermosynechoccus elongatus BP-1 or filamentous Cyanobacteria [175,176]. Electroporation has been used to introduce DNA into animal cells, plant cells and many bacteria including several Cyanobacteria. Optimum conditions for electroporation of a replicating plasmid in Anabena nidulans sp. strain M-131 were field strength of 8 Kv cm-1 and a time constant of 5 ms-1 . As is true for conjugation, restriction of DNA is a significant problem; a single unmodified AvaII site reduces transformation efficiency about 100-fold . Electroporation has some advantages over conjugation: E. coli cells do not contaminate the transformants; vectors lacking a bom site may serve as donors; and electroporation requires only DNA and washed host cells. The ability to methylate the donor DNA in vitro, to produce linear plasmids for transfer (yielding exclusively double recombinants after integration into the chromosome) and to use chromosomal DNA as the donor are potential advantages of electroporation that have not yet been explored (Figure 4). The genetic engineering offers the forecast asset and permits the introduction of numerous divergent desirable genes at a single event and rebate the time. The first report of transgenic plants  has been accelerated and used for practical ends of crop improvement. The plant genetic engineering practices involve mainly two important technologies cellular and molecular biology. Bacillus thureingenesis engross world’s leading position as biopesticide, accounting for ca. 90% of biopesticide sales . Gene encoding in sweet potato, trypsin inhibitor in transgenic tobacco results in severe growth retardation of Spodoptera litura caterpillars fed on it . The osmolytes like mannitol fructans, proline, trehelose, ononitol production by genetic engineering increase resistance to drought but the mechanism of these osmolytes in protection yet to be discovered  . In transgenic tobacco plants the tolerance of salt stress and drought, due to over express of inositol methyl transferase gene (IMT1) from ice plant (Mesembryanthemum crystallinum) increased by the accumulation of methylated form of inositol, D-ononitol . Mannitol, a photosynthetic product of higher plants and many algae aggrandize the tolerance to water-deficiency mainly through osmotic adjustments . Mannitol dehydrogenase (mtlD) was introduced into wheat results in the increment of water stress tolerance . The genes AtGolS1and AtGolS2 shows tolerance to drought resistance due to accumulation of galactinol and raffinose, which are osmoprotectants in Arabidopsis plants . Bacterial fructan gene was engineered in sugar beet and tobacco plants showed drought stress tolerance [185,186]. Many crops were genetically modified, implicates insect resistance, plant pathogen and herbicide resistance and also for slow ripening, seedless fruits and increased sweetness (Table 3) . Soybean, potato, cotton, corn and canola occupies largest area of engineered crops [188,189]. The genes Adh and Pdc introduced into hairy roots of Arabidopsis thaliana to improve the low oxygen conditions . The production of fatty alcohols in genetically engineered E.coli by fatty acyl Co-A reductases from Jojoba , mouse , Arabidopsis thaliana . By using metabiloc engineering E. coli strains produce 1.6 mg zeaxanthin/g dry weight . Many antibiotic resistant genes are successfully used for microalgae transformant selection, includes chloramphenicol , hygromycin , spectinomycin [197,198], streptomycin , paromomycin [199,200-256]. The biotechnological importance of Spirogyra, produces bioactive substances (Table 2). Jones W and Mayers JA. Common link between photosynthesis and respiration in a blue green algae. Nature. 1963;199:670-672. Gallon JR. Reconciling the incompatible: N2 fixation and O2, New Phytologist. 1992;122:571-609. Berman-Frank I, et al. Nitrogen fixation and photosynthetic oxygen evolution in cyanobacteria. Res Microbiol. 2003;154:157-164. Zhang CC, et al. Heterocyst differentiation and pattern formation in cyanobacteria : A chorus of signals. Mol Microbiol. 2006; 59: 367-375. Doughlas SE. Plastid evolution: origins, diversity, trends. Curr Opin Genet Dev. 1998; 8:655-661. Rodriguez-Ezpeleta N, et al. Monophyly of primary photosynthetic eukaryotes: green plants, red algae and glaucophytes. Curr Biol. 2005;15:1325-1330. Chitinis VP and Chitinis PR. Psa L subunit required for the formation of photosystem Ã¢ÂÂI trimers in the cyanobacterium Synechocystis sp. PCC 6803. FEBS Lett. 1993;336:330-334. Shen G and Vermaas WF. Chlorophyll in a Synecchocystis sp. PCC 6803 mutant without photosystem Ã¢ÂÂI and photosystem Ã¢ÂÂII core complexes. Evidence for peripheral antenna chlorophylls in cyanobacteria. J Biol Chem. 1994;269:13904-13910. Jordan P, et al. Three-dimensional structure of cyanobacterial photosystem I at 2.5 A resolution. Nature. 2001;411:909-917. Ferreira KN, et al. Architecture of the photosynthetic oxygen Ã¢ÂÂevolving center. Science. 2004;303:1831-1838. Loll B, et al. Towards complete cofactor arrangement in the 3.0 resolution structure of photosystem II. Nature. 2005;438:1040-1044. Kaneko T, et al. Sequence analysis of the genome of the unicellular cyanobacterium Synechocystis sp.6803. II. Sequence determination of the entire genome and assignment of potential protein-coding regions. DNA Res. 1996;3:109-136. Porter RD. 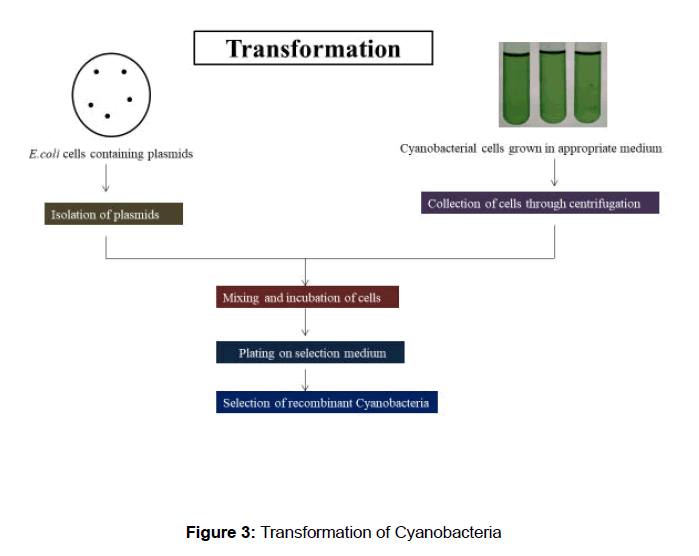 Transformation in cyanobacteria. Crc Crit Rev Microbiol. 1988;13:111-132. Tandeau de Marsac N and Houmard J.. Advances in cyanobacterial molecular genetics. In: Fay P and Van Baalen C (eds.) The Cyanobacteria. Elsevier, Amsterdam.1987;251-302. Shestakov SV and Reatson J. Gene transfer and host-vector systems of cyanobacteria. Oxford Surveys of Plant Molecular and Cell Biology. 1987;4:137-166. Houmard J and Tandeau de Marsac N. Cyanobacterial genetic tools: Current status. Meth Enzymol. 1988;167:808-847. Wolk CP, et al. Use of a transposon with luciferase as a repoter to identify environmentally responsive genes in a cyanobacterium. Proc Natl Acad Sci USA. 1991;88:5355-5359. Buikema WJ and Haselkorn R. Molecular genetics of cyanobacterial development. Ann. Rev Plant Physiol and Plant Mol Biol. 1993;44:33-52. Theil T and Wolk C P. Conjugal transfer of plasmids to cyanobacteria. Meth Enzymol. 1987;153:232-243. Elhai J and Wolk CP. Conjugal transfer of DNA to cyanobacteria. Meth Enzymol. 1988b;167:747-754. Golden SS. Mutagenesis of cyanobacteria by classical and gene - transfer based methods. Meth Enzymol.1988;167:714-727. Porter RD. DNA transformation. Meth Enzymol. 1988;167:703-712. Williams JG. Construction of specific mutations in Photosystem II photosynthetic reaction center by genetic engineering methods in Synechocystis 6803. Meth Enzymol. 1988;167:766-778. Haselkorn R. Genetic systems in cyanobacteria. Meth Enzymol. 1991;204:418-430. Tandeau de Marsac N and J. Houmard, Ã¢ÂÂAdaptation of Cyanobacteria to Environmental Stimuli: New Steps towards Molecular Mechanisms,Ã¢ÂÂ. FEMS Microbiology Letters. 1993;104:119-189. Tamagnini P, et al. Cyanobacterial hydrogenases: diversity, regulation and applications. FEMS Microbiol Rev. 2007;31:692-720. Dismukes GC, et al. Aquatic phototrophs: efficient alternatives to land Ã¢ÂÂbased crops for biofuels. Curr Opin Biotechnol. 2008;19:235-240. Gressel J. Transgenics are imperative for biofuels crops. Plant Sci. 2008;174:246-263. Singh S, et al. Bioactive compounds from cyanobacteria and microalgae: an overview. Crit Rev Biotechnol. 2005;25:73-95. Eriksen NT. Production of phycocyanin Ã¢ÂÂa pigment with applications in biology, biotechnology, foods and medicine. Appl Microbiol Biotechnol. 2008;80:1-14. Fernandes BD, et al. Characterization of split cylinder airlift photobioreactors for efficient microalgae cultivation. Chem Eng Sci. 2014;117:445-54. Kolk AJ, et al. Simultaneous growth and neutral lipid accumulation in microalgae. Bioresour Technol. 2013a;134:233-43. Markou G and Nerantzis E. Microalgae for high-value compounds and biofuels production: a review with focus on cultivation under stress conditions. Biotechnol Adv. 2013;31:1532-42. Mata TM, et al. Microalgae for biodiesel production and Rather applications: A review. Renew. Sustain. Energy Rev. 2010;14:217-232. Wijffels RH, et al. Potential of industrial biotechnology with cyanobacteria and eukaryotic microalgae. Curr Opi Biotech. 2013;24:405-413. Dismukes GC. Aquatic phototrophs: efficient alternatives to land-based crops for biofuels. Current Opinion in Biotechnology. 2008;19:235-240. Cuaresma M, et al. Productivity of Chlorella sorokiniana in a short light-path (SLP) panel photobioreactor under high irradiance. Biotechnol Bioeng. 2009;104:352-359. Gonzalez-Lopez CV, et al. Development of a process for efficient use of CO2 from flue gases in the production of photosynthetic microorganisms. Biotechnol Bioeng. 2012;109:1637-50. Gutierrez-Wing MT, et al. Impact of light quality and quantity on growth rate kinetics of Selenastrum capricornutum. Eng Life Sci. 2012;12:79-88. Rusch KA and Christensen JM. The hydraulically integrated serial turbidostat algal reactor (HISTAR) for microalgal production. Aquac Eng. 2003;27:249-64. Sforza E, et al. Design of microalgal biomass production in a continuous photobioreactor: an integrated experimental and modelling approach. Chem Eng Res Des. 2014;92:1153-1162. Tang H, et al. Continuous microalgae cultivation in a photobioreactor. Biotechnol Bioeng. 2012;109:2468-74. Zijffers JWF, et al. Maximum photosynthetic yield of green microalgae in photobioreactors. Mar Biotechnol (NY). 2010;12:708-718. Kaczmarzyk D and Fulda M. Fatty acids activation in cyanobacteria mediated by acyl-acyl carrier protein synthetase enables fatty acid recycling. Plant Physiology. 2010; 152:1598-1610. Sato N and Wada H. Lipid biosynthesis and its regulation in cyanobacteria. In H. Wada and N. Murata (Eds. ), Lipids in photosynthesis (pp.157-177), The Netherlands: Springer. Zhang S and Bryant DA. The tricarboxylic acid cycle in cyanobacteria, Science. 2011;334:1551-1553. Steinhaser D, et al. Unusual cyanobacterial TCA cycles: Not broken just different. Trends in Plant Science. 2012;17:503-509. Jansson C. Metabolic engineering of cyanobacteria for direct conversion of CO2 to hydrocarbon biofuels. In U. Luttge (Ed.,), progress in botany, Berlin, Heidelberg: Springer. 2012;73:81-93. Yoo SH, et al. Characterisation of cyanobacterial glycogen isolated from the wild type and from a mutant lacking of branching enzyme. Carbohydrate Research. 2002;337:2195-2203. Nakamura Y, et al. Some cyanobacteria synthesize semi-amylopectin type a- polyglucans instead of glycogen. Plant Cell Physiology. 2005;46:539-545. Yoo SH, et al. Effects of growth condition on structure of glycogen produced in cyanobacterium Synechocystis sp. PCC6803. International Journal of Macromolecules. 2007;40:498-504. Bhati R, et al. Poly ÃÂ- hydroxyl butyrate accumulation in cyanobacteria under photoautrophy. Biotechnology Journal. 2010;5:1181-1185. Machado IMP and Atusmi S. Cyanobacterial biofuel production. Journal of Biotechnology. 2012;162:50-56. Rosgaard L, et al. Bioengineering of carbon fixation, biofuels and biochemicals in cyanobacteria and plants. Journal of Biotechnology. 2012;162:134-147. Tan X, et al. Production of photosynthetic biofuels by genetically engineering cyanobacteria. Current Chemical Biology. 2012;6:26-31. Daroch M, et al. Recent advances in liquid biofuel production from algal feedstocks. Applied Energy. 2013;102:1371-1381. Liu X, Sheng J and Curtiss R III. Fatty acid production in genetically modified cyanobacteria, Proceedings of National Academy of Sciences of the United States of America. 2011;108:6899-6904. Melnicki MR, et al. Feed-back controlled led photobioreactor for photophysiological studies of cyanobacteria. Bioresource Technology. 2013;134:127-133. Melnicki MR, et al. Sustained H2 production driven by photosynthetic water splitting in a unicellular cyanobacterium. mBio. 2012;3:e00197-eoo212. Deng MD and Coleman JR. Ethanol synthesis by genetic engineering in cyanobacteria. Applied and Environmental Microbiology. 1999;65:523-528. Lele S, et al. Algal Bioprocess Technology. New age International Pvt Led Publishers. 2007. Srivastava AK. Stress Biology of cyanobacteria: Molecular Mechanisms to Cellular responses. CRC Press, Boca Raton, FL, USA. 2013. Khan N Z. Vesicle transport with Emphasis on chloroplasts. University of Gothenburg. 2013. Partensky F, et al. Prochlorococcus, a marine photosynthetic prokaryote of global significance. Microbiol Mol Bio Rev. 1999;63:106-127. Tomitani A, et al. Chlorophyll-b and phycobilins in the common ancestor of cyanobateria and chloroplasts. Nature (London). 1999;400:159-162. Kuhl M, et al. A niche for cyanobacteria containing chlorophyll d. Nature (London). 2005;433:820. Zehr JP, et al. Unicellular cyanobacteria fix N2 in the subtropical north pacific ocean Nature (London). 2001;412:635-638. Drews G and Nultsch W.. Spezielle Bewegungsmechanismen von Einzellern. In: Ruhland W (ed) Hndbuch der Pflanzenphysiologie. Springer, Berlin. 1962; 17: 887-894. Nultsch W. Der Einub des Lichtes auf die Bewegung der Cyanophyceen: photophobotaxis bei Phormiduim uncinatum. Planta. 1962;58:647-663. Nultsch W and Hader DP. Uber die Rolle der beiden Photosysteme in der Photophobo-taxis von Phornidium unicatum. Ber Dtsch Bot Ges. 1974;87:83-97. Bhaya D. Light matters: phototaxis and signal transduction in unicellular cyanobacteria. Mol Microbiol. 2004;53:745-754. Knoll AH .2003. Life on a young planet. Princeton University Press, Princeton. Bekker A, et al. Dating the rise of atmospheric oxygen. Nature (London). 2004;427:117-126. Gupta RS, et al. Evolutionary relationships among photosynthetic prokaryotes (Heliobacterium chloroum. Chloroflexus aurantiacus, cyanobacteria, Chlorobium tepidum and protobacteria): implications regarding the origin of photosynthesis. Mol Microbiol. 1999;32:893-906. Cavaliar- Smith T. Cell evolution and earth history: stasis and revolution. Phil Trans R Soc B. 2006;361:969-1006. Tomitani A, et al. The evolutionary diversification of cyanobacteria: molecular- phylogenetic and paleontological perspectives. Proc Natl Acad Sci USA. 2006;103:5442-5447. Bekker A, et al. Dating the rise of atmospheric oxygen. Nature. 2004;427:117-120. Schopf JW and Packer BM. Early Archean (3.3 billion to 3.5 billion year-old) microfossils from Warrawoona group, Australia. Science. 1987;237:70-73. Schopf JW. Microfossils of the early Archean apex chert: new evidence of the antiquity of life. Science. 1993;260:640-646. Knoll AH. The geobiological consequences of evolution. Geobiology. 2003;1:3-14. Battistuzzi FU, et al. A genomic timescale of prokaryote evolution: insights into the origin of methanogenesis, phototrophy, and the colonization of land, BMC Evol Biol. 2004;4:44. Goldblatt C, et al. Bi stability of atmospheric oxygen and the great oxidation. Nature (London). 2006;443:683-686. Tamagnini P, et al. Hydrogenases and hydrogen metabolism of cyanobacteria. Microbiol Mol Biol Rev.2002;66:1-20. Boussiba S, et al. Nitrogen fixing cyanobacteria as gene delivery system for expressing mosquitocidal toxins of Bacillus thuriengenesis ssp. israelensis J. Appl. Phycol. 2000;12:461-467. Elhai J and Wolk CP. Conjugal transfer of DNA to cyanobacteria. Methods Enzymol. 1998a;167:747-754. John RP, et al. Micro and macroalgal biomass: a renewable source for bioethanol. Bioresour Technol. 2011;102:186-193. Schmidt BJ, et al. Metabolic systems analysis to advance algal biotechnology. Biotechnol J. 2010;5:660-670. Heidorn T, et al. Synthetic Biology in cyanobacteria: engineering and analyzing novel functions. In: Voigt C, editor. Methods in Enzymology. Synthetic Biology, Methods for Part/ Device Characterization and Chassis Engineering. Pt Asan Diego: Elsevier Academic Press Inc. 2011;497:539-579. Muers M. Synthetic biology Simplifying design. Nat Rev Genet. 2012;13-72. Carrieri D, et al. Photocatalytic conversion of carbon dioxide to organic acids by a recombinant cyanobacterium incapable of glycogen storage. Energy and Environmental Science. 2012;5:9457-9461. Grundel M, et al. Impaired glycogen synthesis causes metabolic overflow reactions and affects stress responses in the cyanobacterium Synechocystis sp. PCC 6803. Microbiology. 2012;158:3032-3043. Niederholtmeyer H, et al. Engineering cyanobacteria to synthesize and export hydrophilic products. Applied and Environmental Microbiology. 2010;76, 3462-3466. Ducat DC, et al. Rerouting carbon lux to enhance photosynthetic productivity. Applied and Environmental Microbiology. 2012;78:2660-2668. Xu Y, et al. Altered carbohydrate metabolism in glycogen synthase mutants of Synechococcus sp. strain PCC 7002: Cell factories for soluble sugars. Metabolic Engineering. 2013;16:56-67. Hickman JW, et al. Glycogen synthesis is a required component of the nitrogen stress response in Synechococcus elongatus PCC 7942. Algal Research. 2013;2: 98-106. Melinicki MR, et al. Feedback-controlled led photobioreactor for photophysiological studies of cyanobacteria. Bioresource Technology. 2013;134:127-133. Melinicki MR, et al. Sustained H2 Production driven by photosynthetic water splitting in a unicellular cyanobacterium. m Bio. 2012;3:e000197-e000212. Vu TT, et al. Genome scale modeling of light driven reductant portioning and carbon fluxes in diazotrophic unicellular cyanobacterium Cyanothece sp. ATCC 51142. PLoS Computational Biology. 2012;8:c1002460. Lindberg P, et al. Engineering a platform for photosynthetic isoprene production in cyanobacteria using Synechocystis as the model organism. Metabolic Engineering. 2010;12:70-79. Bentley FK and Melis A. Diffusion-based process for carbon dioxide uptake and isoprene emission in gaseous/aqueous two-phase photobioreactors by photosynthetic microorganisms. Biotech Bioeng. 2012;109:100-109. Reinsvold RE, et al. The production of the sequiterpene ÃÂ-caryophyllene in a transgenic strain of the cyanobacterium Synechocystis. Journal of Plant Physiology. 2011;168:848-852. Bentley FK, et al. Paradigm of monoterpenes (ÃÂ-phellandrene) hydrocarbons production via photosynthesis in cyanobacteria. Bioenergy Research. in press. Price GD and Badger MR. Expression of human carbonic anhydrase in the cyanobacterium Synechococcus PCC 7942 creates a high- CO2 requiring phenotype. Plant Physiol. 1989;91:505-513. Gruber MY, et al. Cloned Mn-superoxide dismutase reduces oxidative stress in Escherichia coli and Anacystis nidulans. Proc, Natl, Acad, Sci USA.1990;87:2608-2612. Takeshima de Marsac NF, et al. Expression of the larvicidal gene of Bacillus sphaericus 1853M in the cyanobacterium Anacystis nidulans R2. Mol Gen Genet. 1987;209:396-398. Nomura MM, et al. Synechococcus sp. PCC 7942 transformed with Escherichia coli bet genes produces glycine betaine from choline and acquires resistance to salt stress. Plant Physiol. 1995;107:703-708. Soltes-Rak E, et al. Effect of promoter modification on mosquitocidal cry 1V gene expression in Synechococcus sp. strain PCC 7942. Appl. Environ. Microbiol.1993;59:2404-2410. Tandeau de Marsac N, et al. Expression of the larvicidal gene of Bacillus sphaericus 1853M in the cyanobacterium Anacystis nidulans R2. Mol Gen Genet. 1987;209:396-398. Deng M-D and Coleman JR. Ethanol synthesis by genetic engineering in cyanobacteria. Applied and Environmental Microbiology. 1999;65:523-528. Dexter J and Fu P. Metabolic engineering of cyanobacteria for ethanol production. Energy Environ Sci. 2009;2:857. Gao ZX, et al. Photosynthetic production of ethanol from carbon dioxide in genetically engineered cyanobacteria. Energy Environ. Sci. 2012;5:9857-9865. Lan EI and Liao JC. ATP drives direct photosynthetic production of 1-butanol in cyanobateria. Proc. Natl. Acad. Sci. U.S.A. 2012;109:6018-6023. Ungerer J, et al. Sustained photosynthetic conversion of CO2to ethylene in recombinant cyanobacterium Synechocystis 6803. Energy Environ. Sci. 2012;5:8998. Huo YX, et al. Toward nitrogen neutral biofuel production. Curr Opin Biotechnol. 2012;23:406-413. Golden JW, et al. Rearrengement of nitrogen fixation genes during heterocyst differentiation in the cyanobacterium Anabena. Nature. 1985;314:419-423. Steinberg NA and Meeks JC. Physiological sources of reductant for nitrogen fixation activity in Nostoc sp. strain UCD 7801 in symbiotic association with Anthoceros punctatus. J Bacteriol. 1991;173:7324-7329. Wolk CP, et al. Construction of shuttle vectors capable of conjugative transfer from Escherichia coli to nitrogen - fixing filamentous cyanobacteria Proc NatI Acad Sci USA. 1984;81:1561-1565. Wolk CP, et al. Isolation and complementation of mutants of Anabaena sp. strain PCC 7120 unable to grow aerobically on dinitrogen. J Bacteriol. 1988;170:1239-1244. Buikema WJ and Haselkorn R. Isolation and complementation of nitrogen fixation mutants of the cyanobacterium Anabaena sp. strain PCC 7120. J Bacteriol. 1991b;173:1879-1885. Bagdesarian M, et al. Specific-purpose plasmid cloning vectors, II. Broad host range, high copy number, RSFlOlO-derived vectors, and a host-vector system for gene cloning in Pseudomonas. Gene. 1981;16:237-247. Kreps S, et al. Conjugative transfer and autonomous replication of a promiscuous IncQ plasmid in the cyanobacterium Synechocystis PCC 6803. Mol Gen Genet. 1990;221:129-133. Prosperi C, et al. Maintenance of broad host range vector pKT230 in marine unicellular cyanobacteria. FEMS Microbiol Lett. 1991;99:73-78. Sode K, et al. Conjugative gene transfer in marine cyanobacteria: Synechococcus sp., Synechocystis sp. and Pseudanabaena sp. Appl Microbiol Biotech. 1992;37:369-373. Vachhani AK, et al. A mobilizable shuttle vector for the cyanobacterium Plectonema boryanum. J Gen Microbiol. 1993;139:569-573. Friedberg D and Seijffers J. Controlled gene expression utilising lambda phage regulatory signals in a cyanobacterium host. Mol Gen Genet. 1986;203:505-510. Ferino F and Chauvat F. A promoter-probe vector-host system for the cyanobacterium, Synechocystis PCC 6803.Gene. 1989;84:257-266. Frey, J and Bagdasarian, M. The molecular biology of IncQ plasmids. In Promiscuous Plasmids of Gram-Negative Bacteria, Edited by C. M. Thomas. London: Academic Press. 1989;79-93. Mermet-Bouvier P, et al. Transfer and replication of RSF1010-derived plasmids in several cyanobacteria of the genera Synechocystis and Synechococcus. Curr Microbiol. 1993;27:323-327. Mermet-Bouvier P and Chauvat F. A conditional expression vector for the cyanobacteria Syniechocystis sp. strains PCC 6803 and PCC 6714 or Synechococcus sp. strains PCC 7942 and PCC6301. Curr Microbiol. 1994;28:145-148. Murry MA and Wolk CP. Identification and initial utilization of a portion of the smaller plasmid of Anabaena variabilis ATCC 29413 capable of replication in Anabaena sp. strain M. Mol Gen Genet. 1991;227:113-119. Chiang GG, et al. Transformation of the filamentous cyanobacterium Fremyella diplosiphon by conjugation or electroporation. Plant Physiol Biochem.1992a;30:315-325. Reaston J, et al. A physical map of plasmid pDUI from the cyanobacterium Nostoc PCC 7524. Plasmid. 1982;7:101-104. Schmetterer G and Wolk CP. Identification of the region of cyanobacterial plasmid pDU I necessary for replication in Anabaena sp. strain M-131. Gene. 1988;62:101-109. Walton OK, et al. Nucleotide sequence of the replication region of the Nostoc PCC 7524 plasmid pDU I. Nucleic Acids Res. 1992;20:4660. Flores E and Wolk CP. Identification of facultatively heterotrophic, N2-fixing cyanobacteria able to receive plasmid vectors from Escherichia coli by conjugation. J Bacteriol. 1985;162:1339-1341. Sankara Subramanian S and Kaushik BD. Development of genetic markers in cyanobacteria and stability of genetically marked strains in soil. World Journal of Microbiology and Biotechnology. 2001;17:535-544. Griesbeck C, et al. Chlamydomonas reinhardtii. A protein expression system for pharmaceutical and biotechnological proteins. Molecular Biotechnology. 2006;34: 213-223. Leon-Banares R. Transgenic microalgae as green cell-factories. Trends Biotechnol. 2004;22:45Ã¢ÂÂ52. Walker TL, et al. Microalgae as bioreactors. Plant Cell Rep. 2005;24:629-641. Manimaran P, et al. Sustainability of non-lethal marker and marker-free systems for development of transgenic crop plants; present status and future prospects. Biotechnol Adv. 2011;29:703-714. Elhai J, et al. DNA transfer into cyanobacteria. In: Gelvin Sand Schilpoort R (eds.) Plant Molecular Biology Manual A12. Martinus Nijhoff, Amsterdam. 1990; 1-23. Elhai J. and Wolk CP. Conjugal transfer of DNA to cyanobacteria. Methods Enzymol. 1988;167:747-754. Zhu J, et al. HcwA, an autolysin, is required for heterocyst maturation in Anabaena sp. strain PCC 7120. J Bacteriol. 2001;183:6841-6851. Tsinoremas NF, et al. Efficient gene transfer in Synechococcus sp. strains PCC 7942 and PCC 6301 by interspecies conjugation and chromosomal recombination. J Bacteriol. 1994;176:6764-6768. Dienst D, et al. The cyanobacterial homologue of the RNA chaperone Hfq is essential for motility of Synechocystis sp. PCC 6803. Microbiology. 2008;154:3134-3143. Shestakov SV and Khyen NT. Evidence for genetic transformation in blue-green alga Anacystis nidulans. Mol Gen Genet. 1970;107:372-375. Porter RD.Transformation in cyanobacteria. Crc Crit Rev Microbiol. 1986;13:111-132. Golden SS and Sherman LA. Optimal conditions for genetic transformation of the cyanobacterium Anacystis nidulans R2. J Bacteriol. 1984;158:36-42. Porter RD. DNA transformation. Meth Enzymol. 1988;167703-712. Herdman M and Carr NG. Recombination in Anacystis nidulans mediated by an extracellular DNA/RNA complex. J Gen Microbiol. 1971;68:xiv. Grigorieva GA and Shestakov SV. Application of the genetic transformation method for taxonomic analysis of unicellular blue-green algae. In: Proc 2nd Int Symp Photosynthetic Prokaryotes Dundee, Scotland. 1976; 220-221. Wilmotte AMR and Starn WT. Genetic relationships among cyanobacterial strains originally designated as 'Anacystis nidulans' and some other Synechococcus strains. J Gen Microbiol. 1984;103:2737-2740. Golden SS, et al. Genetic relationship of two highly studied Synechococcus strains designated Anacystis nidulans. J Bacteriol. 1989;171:24-29. Kaneko T, et al. Sequence analysis of the genome of the unicellular cyanobacterium Synechocystis sp. strain PCC6803. II. Sequence determination of the entire genome and assignment of potential protein-coding regions. DNA Res. 1996;3:109-136. Carpenter SD and Vermaas WFJ. Directed mutagenesis to probe the structure and function of photosystem II. Physiol Plantarum. 1989;77:436-443. Smart LB, et al. Targeted genetic inactivation of the Photo system I reaction center in the cyanobacterium Synechococcus sp. PCC 6803. EMBO J.1991;10:3289-3296. Shen G and Vermaas WF. Chlorophyll in a Synechocystis sp. PCC 6803 mutant without photosystem I and photosystem II core complexes. Evidence for peripheral antenna chlorophylls in cyanobacteria. J Biol Chem. 1994;269:13904-13910. Smart LB, et al. Genetic manipulation of the cyanobacterium Synechocystis sp. PCC 6803. Plant Physiol. 1994;104:349-354. Essich E, et al. Chromosomal transformation in the cyanobacterium Agmenellum quadruplicatum. Bacteriol. 1990;172:1916-1922. Stevens SE Jr and Porter RD. Transfonnation in Agmenellum quadruplicatum. Proc Natl Acad Sci USA. 1980;77:6052-6056. Grigorieva GA and Shestakov SV. Transformation in the cyanobacterium Synechocystis PCC 6803. FEMS Microbiol Lett. 1982;13:367-370. Sparling PF. Genetic transformation of Neisseria gonorrhoeae to streptomycin resistance. J Bacteriol. 1966;92:1364-1371. Biswas GD, et al. Factors affecting genetic transformation of Neisseria gonorrhoeae. J Bacteriol. 1977;129:983-992. Lorenz MG and Wackernagel W. Bacterial gene transfer by natural genetic transformation in the environment. Microbiol Rev. 1994;58:563-602. Averhoff B. DNA transport and natural transformation in mesophilic and thermophilic bacteria. J Bioenerg Biomem. 2004;36:25Ã¢ÂÂ33. Stone BJ and Kwaik YA. Natural competence for DNA transformation by Legionella pneumophila and its association with expression of type IV pili. J Bacteriol. 1999;181:1395-1402. Kennan RM, et al. The type IV fimbrial subunit gene ( fimA) of Dichelobacter nodosus is essential for virulence, protease secretion, and natural competence. J Bacteriol. 2001;183:4451-4458. Yoshihara S, et al. Mutational analysis of genes involved in pilus structure, motility and transformation competency in the unicellular motile cyanobacterium Synechocystis sp. PCC 6803. Plant Cell Physiol. 2001;42:63-73. Nudleman E and Kaiser D. Pulling together with type IV pili. J Mol Microbiol Biotechnol. 2004;7:52-62. Jakovljevic V, et al. PilB and PilT are ATPases acting antagonistically in type IV pilus function in Myxococcus xanthus. J Bacteriol. 2008;190:2411-2421. Thiel T and Poo H. Transformation of a filamentous cyanobacterium by electroporation. J Bacteriol. 1989;171:5743-5746. Chiang GG, et al. Transformation of the filamentous cyanobacterium Fremyela diplosiphon by conjugation or electroporation. Plant Physiol Biochem. 1992;30:315-325. Horsch RB. A simple and general method for transferring genes into plants. Science. 1985;227:1229-1231. Neale MD. Neale Analysis of Reading Ability-Revised: Manual for Schools. NFER-Nelson, Windsor. 1997. Yeh KW, et al. Functional activity of sporamin from sweet potato (Ipomoea batatas) Ã¢ÂÂ a tuberous storage protein with trypsin inhibitor activity. Plant Mol Biol. 1997;33:565-570. Ramanjulu S and Bartels D. Drought and Desiccation-Induced Modulation of Gene Expression in Plants. Plant, Cell and Environment. 2002;25:141-151. Sheveleva E, et al. Increased salt and drought tolerance by d-ononitol production in transgenic Nicotiana tabacum L. Plant Physiol. 1997;115:1211-1219. Loescher WH, et al. Mannitol synthesis in higher plants: evidence for the role and characterization of a NADP dependent mannose-6-phosphate reductase. Plant Physiol. 1992;98:1396-1402. Abebe T, et al. Tolerance of mannitol accumulating transgenic wheat to water stress and salinity. Plant Physiol. 2003;131:1748-1755. Taji T, et al. Important roles of drought- and cold-inducible genes for galactinol synthase in stress tolerance in Arabidopsis thaliana. Plant J. 2002;29:417-426. Pilon-Smiths EAH, et al. Improved performance of transgenic fructan-accumulating tobacco under drought stress. Plant Physiol. 1995;107:125-130. Pilon-Smith EAH, et al. Enchanced drought resistance in fructan-producing sugar beet. Plant Physiology and Biochemistry. 1999;37:313-317. Hammond BG and Fuchs RL. Safety evaluation for new varieties of food crops developed through biotechnology. In: Thomas JA (ed.) Biotechnology and Safety Assessment, Washington DC: Taylor & Francis. 1997;61-79. James C. Update in the development and commercialization of genetically modified crops. Int. Serv. Acquisition Agrobiotechnol. Appl. Briefs. 5:1-20. Moff AS. Toting up the early harvest of transgenic plants. Science. 1998;282:2176-2178. Shiao T, et al. Overexpression of alcohol dehydrogenase or pyruvate decarboxylase improves the growth of hairy roots under hypoxia. Biotechno Bioeng. 2002;77:455-461. Metz B, et al. Towards an equitable climate change regime: compatibility with Article 2 of the climate change convention and the link with sustainable development. Climate Policy. 2002;2:211-230. Cheng JB and Russell DWJ. Biol. Chem. 2004;279:37798-37807. Doan TT, et al. Functional expression of five Arabidopsis fatty acyl-CoA reductase genes in Escherichia coli. J. Plant Physiol. 2009;166:787-796. Albrecht M, et al. Synthesis of atypical cyclic and acyclic hydroxy carotenoids in Escherichia coli transformants. J. Biotechnol. 1997;58:177-185. Tang DK, et al. Insertion mutagenesis of Chlamydomonas reinhardtii by electroporation and heterologous DNA. International Journal of Biochemistry and Molecular Biology. 1995;36:1025-1035. Berthold P, et al. An engineered Streptomyces hygroscopicus aph 700 gene mediates dominant resistance against hygromycin B in Chlamydomonas reinhardtii. Protist. 2002;153:401-412. Cerutti H, et al. Epigenetic silencing of a foreign gene in nuclear transformants of Chlamydomonas. Plant Cell. 1997;9:925-945. Doetsch NA, et al. Chloroplast transformation in Euglena gracilis: splicing of a group III twintron transcribed from a transgenic psbK operon. Curr Genet. 2001;39:49-60. Jakobiak T, et al. The bacterial paromomycin resistance gene, aphH, as a dominant selectable marker in Volvox carteri. Protist. 2004;155:381-393. Sizova I, et al. A Streptomyces rimosusaphVIII gene coding for a new type phosphotransferase provides stable antibiotic resistance to Chlamydomonas reinhardtii. Gene. 2001;277:221-229. Muller-Feuga A, et al. The microalgae for aquaculture. In: Stottrup J.G. & McEvoy L.A., eds. Life feeds in marine aquaculture. Oxford, UK: Blackwell. 2003. Atsumi S, et al. Non- fermentative pathways for synthesis of branched-chain higher alcohols as biofuels. Nature. 2008;451:86-89. Ducat DC, et al. Rewriting hydrogenase-dependent redox circuits in cyanobacteria. Proceedings of the National Academy of Sciences of the United States of America. 2011;108:3941-3946. Leino H, et al. Characterization of ten H2 producing cyanobacteria isolated from the Baltic Sea and Finnish lakes. International Journal of Hydrogen Energy. 2014;39:8983-8991. McNeely K, et al. Redirecting reductant flux into hydrogen production via metabolic engineering of fermentative carbon metabolism in a cyanobacterium. Appl Environ Microbiol. 2010;76:5032-5038. Reppas NB and Ridley CP. Methods and Compositions for the Recombinant Biosynthesis of n-alkanes. Joule Unlimited. 2010. Kaiser BK, et al. Fatty aldehydes in cyanobacteria are a metabolically flexible precursor for a diversity of biofuel products. PloS ONE. 2013;8:e58307. Yoshino T, et al. Alkane production by the marine cyanobacterium Synechococcus sp. NKBG15041C possessing the a-olefin biosynthesis pathway. Applied Microbiology and Biotechnology. 2015;99:521-1529. Watanabe F, et al. Characterization of vitamin B12 in an edible green laver (Entromopha prolifera). Appl Biol Sci. 1999;5:99-107. Bentley FK, et al. Heterologous expression of the mevalonic acid pathway in cyanobacteria enhances endogenous carbon partitioning isoprene. Molecular Plant. 2014;7:71-86. Capon RJ, et al. Poly-3-hydroxyalkanoates from marine and fresh water cyanobacteria, Phytochemistry. 1983;22:1181-1184. Stal LJ, et al. Occurrence and role of poly-hydroxy-alkanoate in the cyanobacterium, Oscillatoria linosa, in Novel Biodegradable Microbial Polymers. Springer. 1990;435-438. Campbell JIII, et al. Accumulation of poly-ÃÂ-hydroxybutyrate in Spirulina platensis. Journal of Bacteriology. 1982;149:361-363. Panda B and Mallick N. Enhanced poly-ÃÂ-hydroxybutyrate accumulation in a unicellular cyanobacterium, Synechocystis sp., PCC 6803. Letters in Applied Microbiology. 2007;44:194-198. Lau NS, et al. Cyanobacteria: photoautotrophic microbial factories for the sustainable synthesis of industrial products. Biomed Res Int. 2015;754934. Wang B, et al. Meldrum, Engineering cyanobacteria for photosynthetic production of 3-hydroxybutyrate directly from CO2. Metabolic Engineering. 2013;16:68-77. Atsumi S, et al. Direct photosynthetic recycling of carbon dioxide to isobutyraldehyde. Nat. Biotechnol. 2009;27:1177-1180. Lau NS, et al. RNA-seq Analysis provides insights for understanding photoautotrophic polyhydroxyalkanoate production in recombinant Synechocystis sp. PloS one. 2014;9:e86368. Matsunaga T, et al. Glutamate production from CO2 by marine cyanobacterium Synechococus sp. using novel bisolar reactor employing light diffusing optical fibers. Appl Biochem Biotech. 1991a;28/29:157-167. Jensen GS, et al. Blue-green algae as immuno-enhancer and biomodulator. J Am Nutraceutical Assoc. 2001;3:24-30. Lindberg P, et al. Engineering a platform for photosynthetic isoprene production in cyanobacteria, using Synechocystis as the model organism. Metab Eng. 2010;12:70-79. Niederholtmeyer H, et al. Enineering cyanobacteria to synthesize and export hydrophilic products. Appl Environ Microbiol. 2010;76:3462-3466. Oliver JW, et al. Cyanobacterial conversion of carbon dioxide to 2,3-butanediol. Proc Natl Acad Sci U.S.A. 2013;110:1249-1254. Devilley CI and Houghton JA. A study of genetic transformation in Gleocapsa alpicola. J gen. Microbiol.1977;98:277-280. Woods RP, et al. Genetically modified cyanobacteria for the production of ethanol, the constructs and method there of US Patent 6, 306,639, field 20 February 1998, issued 23 October 2001. Thaygi R, et al. Antimicrobial activity of some cyanobacteria, in Microbial Diversity and Biotechnology in Food Security. Eds, Springer, New Delhi, Indian. 2014; 463-470. Chauhan A, et al. Invitro antibacterial evaluation of Anabena sp. against several clinically significant microflora and HPTLC analysis of its active crude extracts. Indian Journal of Pharmacology. 2010;42:105-107. Jaki B, et al. A novel extracellualar diterpenoid with antibacterial activity from the cyanobacterium Nostoc commune. Journal of Natural Products. 1999;62:502-503. Kajiyama SI, et al. Nostofungicidine, an antifungal lipopeptide from the field grown terrestrial blue green alga Nostoc commune. Tetrahedron Letters. 1998;39:3737-3740. Volk RB. Screening of microalgal culture media for the presence of algicidal compounds and isolation and identification of two bioactive metabolites, excreted by the cyanobacteria, Nostoc insulare and Nodularia harveyana. Journal of Applied Phycology. 2005;17:339-347. Boyd MR, et al. Discovery of cyanovirin-N, a novel human immunodeficiency virus- inactivating protein that binds viral surface envelope glycoprotein gp120: potential applications to microbicide development. Antimicrobial Agents and Chemotherapy. 1997;41:1521-1530. Bokesch, HR, et al. A potent novel anti-HIV protein from the cultured cyanobacterium Scytonema varium. Biochemistry. 2003;42:2578-2584. Loya S, et al. The inhibition of the reverse transcriptase of HIV-I by the natural sulfoglycolipids from cyanobacteria: contribution of different moieties to their high potency. Journal of Natural Products. 2011;9:625-644. Murphy RC and Stevnes SE. Cloning and expression of the cryIVDgene of Bacillus thuringenesis subsp. israelensis in the cyanobacterium Agmenellum quadruplicatum PR-6 and its resulting larvicidal activity. Appl Envir Mircrobiol. 1992;58:1650-1655. Habib MAB, et al. A Review on culture, production and use of Spirulina as food for humans and feeds for domestic animals and fish, FAO Fisheries and Aquaculture Circular. Food and Agriculture Organisation of the United Nations (FAO), Rome. 2008;1-26. Stolz P and Obermayer B. Manufacturing microalgae for skin care. Cosmetics Toiletries. 2005;120:99-106. McEwen, JT, et al. Engineering Synechococcus elongatus PCC 7942 for continuous growth under diurnal conditions. Appl. Environ. Microbiol. 2013;79:1668Ã¢ÂÂ1675. Anfelt J, et al. Using transcriptomics to improve butanol tolerance of Synechocystis sp. strain PCC 6803. Applied and Environmental Microbiology. 2013;79:7419-7427. Wang Y, et al. Metabolomics basis of laboratory evolution of butanol tolerance in photosynthetic Synechocystis sp. PCC 6803. Microbial Cell Factories. 2014;13:151. Matsunaga T, et al. Characterisation of cryptic plasmids from marine cyanobacteria and construction of a hybrid plasmid potentially capable of transformation of marine cyanobacterium, Synechococcus sp. and its transformation. Appl Biochem Biotech 1990;24/25:151-160. Bubzy JS, et al. Plasmid transformation in Agmenellum quadruplicatum PR-6: construction of biphasic plasmids and characterization of their transformation properties. J. Bact. 1983;154:1446-1450. Jha MN and Mishra SK. Biological responses of cyanobacteria to insecticides and their insecticide degrading potential, Bulletin of Environmental Contamination and Toxicology. 2011;75:374-381. Singh DP, et al. Chlorpyrifos degradation by the cyanobacterium Synechocystis sp. strain PUPCCC 64. Environmental Science and Pollution Research. 2011;18:1351-1359. Bestawy EEI. Treatment of mixed domestic Ã¢ÂÂindustrial waste-water using cyanobacteria. Journal of Industrial Microbiology and Biotechnology. 2008;35:1503-1516. Abed RMM and Koster J. The direct role of aerobic heterotrophic bacteria associated with cyanobacteria in the degradation of oil compounds. International Biodeterioration and Biodegradation. 2005;55:29-37. Takano H, et al. CO2 removal by high density culture of a marine cyanobacterium Synechococcus sp. using an improved photobioreactor employing light-diffusing optical fibers. Appl Biochem Biotech. 1992;34/35:449-458. Matsunaga T, et al. A conjugative plasmid vector for promoter analysis in several cyanobacteria of the genera Synechococcus and Synecchocystis. Plant Mol Biotech. 1993;39:250-253. Daniel H, et al. Transformation of the cyanobacterium Anacystis nidulans 6301 with the E.coli plasmid pBR22. Proc Natl acad Sci USA. 1986;83:2546-2550. Kuhlemeler CW, et al. Vectors for cloning in cyanobacteria: construction and characterization of two recombinant plasmids capable of transformation to E.coli K12 and Anacystis nidulans R2. Mol Gen Genet. 1981;184:249-254. Sherman L and Putte VDP. Construction of a hybrid plasmid capable of replication in the bacterium E.coli and the cyanobacterium Anacystis nidulans. J Bacteriol. 1982;150:410-413. Gendel, S, et al. Shuttle cloning vectors for the cyanobacterium Anacystis nidulans. J Bacteriol. 1983;156:148-154. Sode K, et al. Conjugative gene transfer in marine cyanobacteria Synechococcus sp., Synechocystis sp. and Pseudoanabena sp. Appl. Microbiol: Biotech. 1992a;37:369-373. Sode K, et al. Host range and stability analyses of broad range vector plasmid, pKT230, in marine cyanobacteria. FEMS Microbiol Lett. 1992b;99:73-78.